Could This Be A Cure For Your Tension Headaches? Leave a Comment on Could This Be A Cure For Your Tension Headaches? So I wanted to fill you in friends on what’s been going on with me recently as I realised I haven’t done a blog to update you with my migraine/headache progress for a pretty long time now. The good news is that my migraines continue to decrease! Yay! I know, amazing news right? To the point now where I had two whole months migraine free in February and March, a little blip with two migraines close together and now I have just completed another month migraine free which I am over the moon about. I continue to eat an unprocessed, whole foods, plant-based diet as much as possible which I know has been a huge contributing factor to the continual reduction in my migraines. Now for the not such good news. Even though I have effectively been migraine free for long periods of time, my old pain has been replaced with a whole new type of pain. A flippin’ annoying daily, can’t get away from, never ending type of aching pain. Hello tension headaches! So in the past I have always been a sufferer of tension headaches but this was pre migraines and never, ever anywhere close to the extent that I am having them at the moment. 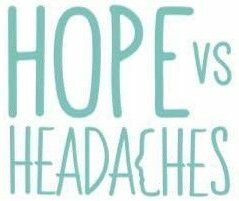 You see, before I suffer a migraine my neck tightens up, it remains tight during the migraine and even after the migraine has gone it still hangs around like bad smell that I can’t get rid of! Gee thanks migraine. As a result I develop a tension headache and this is the cycle I have been stuck in now for so very long. The funny part now (well I guess it’s not actually that funny) is that I’m not even having the migraines to cause the neck pain anymore but I’m still having these daily tension headaches. I guess after four years of my neck tightening and releasing on constant repeat it has just had enough, and I don’t blame it, I have to. So over the past few months with the advice of my doctor I have had chiropractic sessions which seemed to help temporarily but the pain would always return, physiotherapy sessions which I can only describe as four months of massaging torture and some acupuncture thrown in for good luck. It doesn’t matter what I have tried, it only seems to make matters worse as the whole of my neck feels constantly bruised and tender to touch. Most days I wake up feeling like I’ve done ten rounds in the ring with Mike Tyson even after such a simple task as going for a gentle walk. That said, I have recently been given a beacon of hope by my chiropractor that I wanted to share with you. She advised me that several of her patients have been having a treatment through an Orthopedic Consultant that she has been working with whereby the doctor injects a mixture of cortisol and an anti-inflammatory medicine into the neck joint to help reduce the inflammation and therefore the pain. The way my chiropractor described it was that sometimes when you have had chronic pain in an area for a long time, the nerves are so used to constantly firing due to being in that overworked state, that sometimes they need resetting. She advised that three of her patients that had undergone this procedure had felt incredible results. So with a glimmer of hope in my eye, I made my appointment with the specialist hoping that this might actually be the answer. After an MRI Scan and one x-ray later, my results came through and it was as expected. I was diagnosed with severe neck tension. The doctor explained that naturally the spine through the neck should naturally resemble a nice “S” shape, mine looked more like an “I” and like someone had put a steel rod through my neck as it was in a dead straight line. The doctor explained that the joints were under a lot of pressure, dehydrated and were surrounded by inflammation which would be causing my pain and that I was an excellent candidate for the CT guided facet injections. Finally, it all began to make sense. No wonder the flippin’ physio didn’t work as the problem was at the joint and not the muscle, the muscle was tense as a result of the tight joint. So luckily, thanks to the amazing healthcare here in Dubai, it wasn’t long before I was at the hospital having the treatment. It was a simple procedure that took about 40 minutes which involved having four injections into my neck, two on each side. Once the needles were in I was then put back in the CT scanner to make sure that they were exactly in the right place at which point the doctor then injected the medicine into my neck. Piece of cake if I’m honest. Well, after having three rounds of Botox with 36 injections at a time, any injection nowadays feels like a doddle. The full treatment consists of 2-3 rounds of injections and I was advised by the doctor to book in my second set 5-7 days from the first. The third set is normally due a couple of weeks after the second. So yesterday I had round two and I have to say that over the last few days I haven’t had any shoulder pain like I normally do. None, not even an inkling! So I honestly feel like the treatment has already hugely helped me. I can however still feel some tension at the top of my neck, around the occipital area but he advised me that the third set could be put directly in to there and done as a local procedure instead of going to the hospital which is great. It’s funny actually, as about the time that I went to see the chiropractor and she suggested these injections I had just watched Dr Joel Saper do his talk about The Neck and Migraine at The Migraine World Summit. He advised that we have to treat the problem in the neck separately to the migraine, as two different issue’s even though they do interlink. For me this was a sign from the universe pushing me to seek out these injections, and I’m so glad I did. I thought I would share this treatment with you all friends as it might be of use to others who may be struggling with severe tension headaches. Maybe it’s something that you could ask your doctor about? Well, I will keep you updated with my progress friends.